Can you actually shrink your waistline with nitric oxide? You probably know that nitric oxide is great for your circulation. It can help lower your blood pressure. And it can help you avoid altitude sickness. But can it help you lose weight? That might sound crazy — until you see the results from UCLA School of Medicine's research. 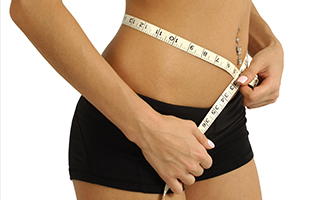 As you may know, having a large waistline is associated with metabolic syndrome and eventually diabetes. Scientists believe that a drop in nitric oxide (NO) plays a significant role in the development of metabolic syndrome. They recently found that dietary supplementation can help reverse this drop. Our bodies are supposed to be able to manufacture some of the NO that we need. But sometimes this process stops working properly. And when it does, our chances of developing both metabolic syndrome and cardiovascular disease increase dramatically. These researchers wanted to find out if there was a way to reduce this risk, even if they couldn't repair the original process. For this study, they examined mice that were deficient in their ability to manufacture NO. They received a dietary supplement in amounts similar to what their bodies would produce if everything was functioning properly. The researchers found that this supplement did indeed increase the mice's levels of bioactive nitrogen oxides. Even better, over time, the supplementation reduced the rodents' visceral fat accumulation and triglyceride levels as well as their need to be labeled as pre-diabetic. They also had lower fasting blood-glucose levels compared to the control group. These are exciting findings for the development of therapies to prevent cardiovascular disease and type-2 diabetes. So how do we get nitric oxide into our diet? It's simple. Eat vegetables! There's a lot of evidence that consuming vegetables helps reduce our risk of developing cardiovascular disease and type-2 diabetes. This study may help to explain one of the reasons vegetables have such a powerful effect. To maximize all the benefits you can get from vegetables, it's best to eat a wide variety and consume several servings a day. But if you're focusing on increasing your consumption of nitric oxide, leafy green vegetables, such as spinach and lettuce, are your best bets. If this doesn't give you the results you need, it's possible your body isn't converting the vegetables to NO. The best way to overcome this problem is to take a supplement, such as CircO2. This product provides a proven way to boost your NO levels in your body. And it's likely to show similar results to those found by these researchers. Després JP, Lemieux I (2006) Abdominal obesity and metabolic syndrome. Nature 444:881–887. Monti LD, et al. (2003) Endothelial nitric oxide synthase polymorphisms are associated with type 2 diabetes and the insulin resistance syndrome. Diabetes 52:1270–1275.